Liquid ring vacuum pump applied to glass industry - Vacuum Pump - EVP Vacuum Solution! With the development of technical equipment, the glass industry has advanced by leaps and bounds, and vacuum adsorption systems have been adopted in glass blowing, glass smelting to remove impurities, glass lifting, handling, glass engraving, glass edging, and glass installation. Due to the high glass melting temperature and the liquid or powder in the process, the liquid ring vacuum pump or liquid ring vacuum pump system is more suitable. Nowadays, it is the explosion of technology and information. The technology is constantly optimized and the efficiency is continuously improved. While pursuing the production speed, we must also save energy and reduce emissions, pay attention to product quality, and more importantly, realize fully automated facilities and reduce costs. In the past, the glass industry processing and production required a lot of labor forcer to do this work, and the unsatisfactory efficiency and capacity have always been a problem that plagued the producers. More importantly, the workers involved have to pay a lot of physical strength, and the operation is slightly careless. Not only will it face the risk of product damage, but it will also endanger the personal safety of workers and expose enterprises to huge risks. Nowadays, the work of product forming, clamping processing, transportation, installation and splicing has begun to use automation, and vacuum adsorption equipment is an important part of it. Due to the particularity of the industry, in the process of product forming and conveying, it is inevitable that there will be substances such as temperature, water vapor, other condensable or non-condensable gases, dust particles, etc. 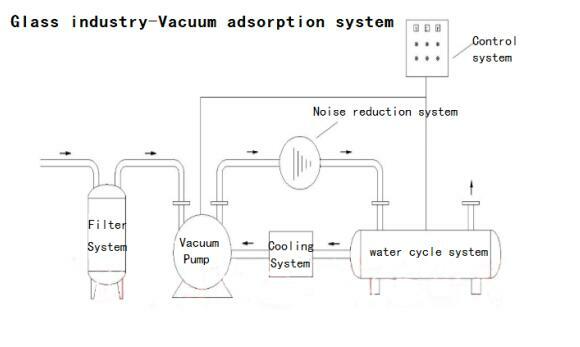 ; in the vacuum adsorption processing technology, it needs to be considered. The vacuum system’s long-time work brings changes, vacuum, pumping capacity, vacuum equipment volume, installation, maintenance and many other factors. Therefore, when choosing the vacuum pump type, the most recommended by the user is the water ring vacuum pump. Shanghai EVP is a comprehensive enterprise integrating R&D, production and sales of water ring vacuum pumps. The vacuum adsorption liquid ring vacuum equipment designed by the company for the glass industry is applied to many large glass manufacturers and has been recognized by users. EVP strives to reach the level of artisans in the liquid ring vacuum pump industry. It has won praises and reputations from countless users for 20 years and strives to reach the industry leading level. 4.Our company has a large number of liquid ring pump in stock,welcome to inquiry us.